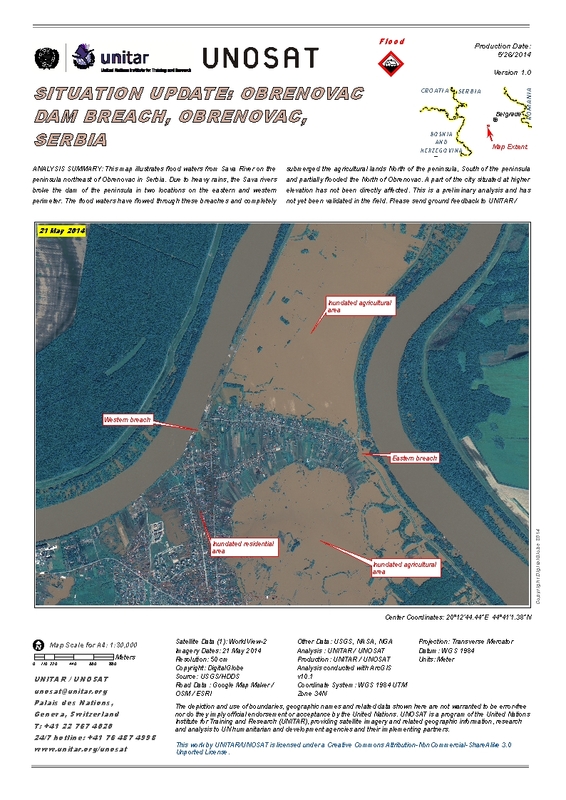 ANALYSIS SUMMARY: This map illustrates flood waters from Sava River on the peninsula northeast of Obrenovac in Serbia. Due to heavy rains, the Sava rivers broke the dam of the peninsula in two locations on the eastern and western perimeter. The flood waters have flowed through these breaches and completely submerged the agricultural lands North of the peninsula, South of the peninsula and partially flooded the North of Obrenovac. A part of the city situated at higher elevation has not been directly affected. This is a preliminary analysis and has not yet been validated in the field. Please send ground feedback to UNITAR / UNOSAT.